Allowing homeowners to add secondary rental units to their property is one of the most promising strategies we have for increasing the supply of housing in San Francisco without significantly changing the aesthetic character of our neighborhoods. A secondary unit (also known as an "in-law unit," accessory dwelling unit or ADU) is an additional, self-contained dwelling on the same lot as an existing residential building. It is usually built within a pre-existing structure but sometimes is an addition to the structure or is in a separate carriage house or storage unit in the rear yard. Secondary units require no additional land or governmental funding. Because they use existing structures and most components and infrastructure (e.g., water, sewer, utilities, landscaping) are in place, and owners can often do some of the work themselves, they are cheaper to build than ordinary housing. The community advantages of secondary units are numerous. They distribute less expensive housing throughout a community and enable the city to expand the housing supply by modest increases in many areas rather than concentrating new housing in just a few. They have the least neighborhood visual impact of all housing sources. And they are true life-cycle housing, supporting flexibility and family stability over time. The extra income from secondary units can help make mortgage payments possible for new homeowners. It can give housing to childcare or in-home health care workers. It can supply extra income when the economic shifts of divorce, untimely death, or illness intervene. And a secondary unit can offer safe, semi- independent, and inexpensive housing for elderly or disabled relatives, as well as returning adult children. Currently, the city makes it hard for property owners to add secondary units. Overly rigid code requirements get in the way, and most residential zoning definitions prohibit secondary units even if the codes can be met. SPUR believes that public scrutiny is the best assurance that the city's housing stock will remain healthy and safe. Regulations that make the legal addition of secondary units difficult, if not impossible, will either lead to units that lack enforcement of health and safety standards or will deprive the city of much-needed housing. None of these proposals would result in enlargement of building envelopes beyond what the codes currently allow, thus assuring that secondary units will not change the visual appearance and character of the neighborhoods in which they are located. The traditional pattern of residential development in San Francisco included secondary units. They were created based on need and demand, often as housing for the working poor, household help, and family members. A great number of illegal units were created in World War II to meet the housing demand generated by the boom in defense jobs. It was estimated by the then Bureau of Building Inspection that by 1960 there were between 20,000 and 30,000 secondary units in San Francisco, 90 percent of which had been built without the proper permits. Those built without permits usually have some substandard conditions with respect to light and air, bath or cooking facilities, ingress or egress, plumbing, electrical or heating systems. They typically exceed the allowable density for the zoning area and usually do not provide required parking. In 1959, the city began a series of housing upgrade programs in various neighborhoods as part of its urban renewal program. The programs involved systematic inspection of all buildings to bring them up to the standards of the newly adopted Housing Code. Long-term, low interest (3 percent) loans were made available to property owners to make the necessary building repairs, install new plumbing and electrical systems, etc. The city carried out various physical improvements to the neighborhoods, such as the planting of street trees, the installation of parking and introduction of traffic mitigation measures. Many illegal secondary units were discovered through this comprehensive inspection. Bringing them up to minimum standards of the Housing Code and keeping them in the housing stock, if there was any potential of doing so, soon became a major objective of the city. A list was developed that differentiated between life-safety and non-lifesafety code items and, through an appeals process, some units were allowed to remain if conditions threatening to health and life were corrected. Parking was not required if the owner could demonstrate that the unit existed prior to 1955, when the parking requirements of the Planning Code were first enacted. In 1978, the city adopted a comprehensive revision of the zoning controls for all residential districts. It created more districts that would allow for variation in some of the requirements for side and rear yards but, for the most part, it did not change the allowable density in the lower density districts. Most of the city's 120,000 single-family homes were placed in RH-1 (Residential-House, One-Family) and RH-1-D (Residential-House, One Family Detached) districts in which density was limited to one unit per standard lot. However, some were placed in RH-2 districts, where two units were permitted, resulting in a number of new legal units being added to these properties in the 1980s and '90s. The 1978 rezoning also created an RH-1-S (Residential-House, One Family with Minor Secondary Unit) district, which permitted a two-family dwelling, with the second dwelling limited to 600 square feet of net floor area. One parking space, which could be compact and tandem rather than independently accessible, was required. At the initiative of property owners, the RH-1-S district was subsequently mapped in four small areas, covering some 40 parcels, as a means of permitting legalization of unauthorized units. The 1978 code revision also permitted dwellings specifically designed for elderly or handicapped occupants to be counted as half a unit. Only one parking space was required for every five elderly/handicapped units. This meant that in the RH-1 or RH-1-D single family districts, a secondary elderly or handicapped unit could be installed without parking, but only if the primary unit was also designed for elderly and handicapped. Very few units have been built in response to this zoning because of the requirement that both units be elderly/handicapped. This is a classic example of legislation that looked good in the newspapers, but failed to actually fulfill its stated purpose. In 1982, the State adopted SB1534, the Mello Act, to promote the development of secondary units as a source of affordable housing. It directed that secondary units be permitted in all California jurisdictions. The means of implementation were left to local discretion, provided that local agencies did not create requirements "so arbitrary, excessive, or burdensome so as to unreasonably restrict the ability of homeowners to create second units." In response, a number of cities in the Bay Area simply allowed secondary units in all residential districts without regard to density limitations. The California Department of Housing and Community Development studied 15 Bay Area jurisdictions in 1992 that had enacted secondary unit ordinances. The Department found that 13 of the 15 jurisdictions (Piedmont and Newark were the exceptions) had enacted ordinances that permitted secondary units citywide, in both single and multi-unit zones. In 1981, the San Francisco Chamber of Commerce developed a Strategic Plan which, among other things, called for development of secondary housing units as a means to create affordable housing. After passage of the Mello Act, the Chamber proposed changes in the Planning Code to encourage secondary units in portions of the city that did not have severe parking constraints, modification of the Building Code to ease construction while protecting health and safety, and amnesty for existing units meeting the revised codes. The proposal was supported by five supervisors as well as a number of housing advocacy and business groups, plus a few neighborhood associations. The Residential Builders Association was (and is) a strong supporter of seconday units. However, it was not supported by mayor, the Planning Commission and its staff, and six members of the Board of Supervisors who, because of the strong opposition of most neighborhood associations, supported instead adoption of Section 207.2 of the Planning Code. This section stated the reasons why the city believed it was already in compliance with the Mello Act without a more liberal allowance of secondary units. It argued that the 1978 zoning provisions cited above, the existing high density in the city, and the extensive zoning of areas for multiple unit buildings, together with the city's relatively aggressive affordability programs, satisfied the Mello Act requirements. The state did not challenge this response to its mandate. In the 1980s and '90s, many new buildings were constructed with ground floor spaces (e.g. a recreational room, a wet bar, a bathroom, and a separate entrance) that were easily convertible to a secondary unit. As secondary units, they would lack the off-street parking and exceed the allowable density. Therefore, as a deterrent to conversion, owners of these new structures (over 10,000 mostly one-unit buildings) were required to record a Notice of Special Restriction (NSR) indicating the number of legal units in the building. How many have since been converted in violation of the Planning Code and the NSR is not known. In 1992, Supervisor Terence Hallinan and, in 1996, Supervisors Mabel Teng and Tom Ammiano proposed amnesty programs with provisions that would have allowed, in varying degrees, legalization of secondary units. These measures were abandoned when the necessary support on the Board could not be obtained. In 1997, the Planning Department developed a compromise to allow legalization of existing unauthorized units and creation of new units by rezoning to RH-1-S those portions of RH-1 and RH-1-D districts located within a five minute walk of both transit and neighborhood shopping. Restriction to these areas was intended to address homeowners' fear of losing on-street parking. A mapping study showed that about 75 percent of all estimated illegal units were within the transit/shopping zones. The owners of illegal units were to pay the normal costs of zoning reclassification plus contribute to the cost of a citywide environmental analysis that would probably be required. All neighbors of the amnesty homes would automatically receive the benefit of the reclassification, and the option for future in-law unit addition, without having to pay for the rezoning. This proposal also failed to gain sufficient support and the effort was abandoned. The city is currently pursuing a rather benign "don't ask, don't tell" attitude toward unauthorized secondary units. Even so, many units are being removed every year. Housing inspectors currently perform periodic internal inspection of buildings with three or more units. While they do not search for unauthorized secondary units, they must deal with them when they are discovered. The city does not do periodic internal inspections of one- and two-unit buildings, but inspectors are obliged to respond to complaints, mainly from neighbors, and deal with any illegalities that are found. Approximately 50 to 100 units are eliminated yearly through code-enforcement. Removing these units from the housing stock leads to displacement of the tenants, often elderly and lower-income. It is clear that there is a strong demand for secondary units and that many building owners are prepared to create them, whether they meet code requirements or not. Because of the important role they play in providing inexpensive housing, it might be counter-productive for the city to take aggressive measures at this time to eliminate illegal secondary units. Therefore, SPUR's proposals are aimed at encouraging new, legal secondary units. In this era of soaring rents and low vacancies, few new legal secondary units, which could relieve some of the pressure on the housing supply, are being created under the current restrictive rules. The greatest deterrents to the creation of code-complying secondary units are the density limits and parking requirements of the Planning Code and, to a lesser extent, the strict application of certain Building Code rules. Given the need for housing and the inequity of denying law-abiding homeowners the ability to add secondary units while seeming to look aside at scofflaws installing unauthorized units, SPUR believes code changes should be made to facilitate the creation of code-complying units of certain types and in areas where their impacts can be minimized. The following proposals are intended to do that. Proximity to major transit lines and shopping facilities makes it feasible for certain areas of the city to absorb somewhat higher densities with lower levels of off-street parking. The requirement of parking is a major deterrent to the creation of legal secondary units. In many cases it is physically difficult, if not impossible, and very expensive to provide parking—particularly independently accessible parking—without consuming the space for the secondary unit, being prohibitively expensive and/or detrimentally altering the appearance of the building. In fact, secondary units actually have little impact as generators of cars and car trips. Smaller in size than most apartments, secondary units tend to house either one or two persons and often persons of lesser means, who statistically tend to own fewer cars. Living carless is the lifestyle of many San Francisco households. In 2000, 29 percent of San Francisco's households did not have an automobile, compared to 9 percent nationwide. Many of these households live in secondary units in neighborhoods that are close to major transit lines and neighborhood shopping that make it convenient to get around without a car. SPUR proposes that the Planning Code be amended to allow a secondary unit of up to 600 square feet of living space in residential districts, without restriction to elderly and handicapped occupancy and without an off-street parking space, on any lot which is within easy walking distance (defined as 1/4 of a mile—approximately a five minute walk at a slow pace) of both a "major transit street or transit center" and a "shopping area." Less open space is needed for a smaller secondary unit than is needed for the larger primary unit. In the RH-1-S zoning district, which permits secondary units, the open space requirement for the secondary unit is one-third of the requirement for the primary unit. That ratio should apply in other districts as well, provided it is not less than 36 square feet. Because it is not possible to provide additional open space when the secondary unit is being constructed within an existing structure, there should be a simple administrative procedure by which the open space requirement could be waived. The owner may choose to provide a parking space (which should be permitted to be tandem and compact) but should not be required to do so if they can ensure that occupants of units without off-street parking will not use on-street parking. Shortage of off-street parking is one of the main sources of neighborhood opposition to in-laws, and it needs to be taken seriously. The issue should be addressed by having building owners installing a secondary unit without parking record an NSR stating that the units may be rented only to tenants who agree not to own or possess a motor vehicle which is parked on a San Francisco public street while the tenants are at home or at work. Examples of somewhat similar enforcement tools exist in both Concord and Oakland, which require that one of the two units in this situation be owner-occupied, codified as a permanent deed restriction. In case of a violation, enforcement is achieved through removal of the certificate of occupancy. San Francisco could enforce the special restriction if the owner fails to include and enforce a "no on-street parking" provision in the lease of the occupant of the secondary unit. Typically, enforcement would be initiated by complaint from a neighbor. A different potential enforcement tool is available in the city's preferential parking program. If the secondary unit is located in a neighborhood preferential parking area (where only a neighborhood resident is permitted to park for longer than two or, in some cases, four hours) occupants at the address of such a unit could be made ineligible for a neighborhood parking permit. SPUR also proposes that the Planning Code text be changed so that the first unit designed for elderly or handicapped would not count against the unit limitation (the code now provides that such units count as half a unit). This would permit the addition of this kind of unit to existing and new family houses in RH-1 and RH-1-D districts, as well as in higher density districts which already have the maximum number of standard units. Many of these units would be located on the ground floor where they are more easily accessible. These specialized units, many of which would accommodate older family members, would usually generate few auto trips and would fill a specialized housing need with minimal impact on the neighborhood. Some neighborhoods or parts of neighborhoods zoned single family (RH-1 and RH-1-D) may welcome secondary units with parking; others may not. 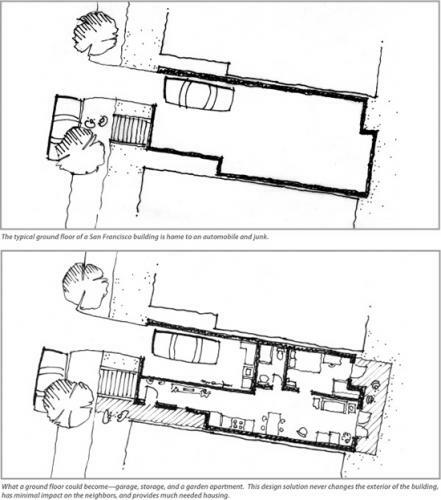 The Planning Code currently provides a mechanism, the RH-1-S district, in which secondary units up to 600 square feet are permitted without restriction to elderly/handicapped design but with compact, tandem parking. SPUR recommends that reclassifications be undertaken in those areas where there is support for the introduction of secondary units. Supervisorial districts may provide the focus for such reclassifications. Many architecturally significant buildings, which provide so much of the charm and character of San Francisco, are at risk of demolition or incompatible alteration. Allowing secondary units without parking may provide the revenue needed to make preservation of these buildings financially feasible. SPUR proposes that "qualified historical buildings or properties" be allowed to have a secondary unit without a parking space on condition that the owner agree to restrictions on demolition or alteration. Adding a secondary unit to a single-family house is relatively straightforward and presents few building code problems. Although somewhat costly, and in some cases somewhat arbitrary, the requirements are usually not prohibitively expensive to meet. Concerns that make legalization of illegal units difficult, such as fire-resistant construction, safe plumbing and electrical services (often behind finished walls in existing illegal units), present little problem with new units. These concerns can easily be avoided at littleor no additional cost and will be addressed in the course of normal building inspection as the unit's construction occurs. Similarly, it is not unreasonably difficult to add another unit to a three- or four-unit building. However, conversion of a two-unit building to a three-unit building is a significant building code change from R-1 (Dwelling) to R-3 (Apartment Building) which triggers all of the requirements for apartment buildings, such as fire rating upgrade of the entire building and possibly fire sprinklers throughout the building. Complying with these requirements will usually make the addition of a third unit to a two-unit building cost prohibitive. At this time, there seems to be no clear way to solve this problem. SPUR supports the Department of Building Inspection's proposed expansion of the use of the State Historic Building Code to apply to more buildings and urges that it apply to all buildings over 50 years old in which there is historic fabric to be protected. This will facilitate the construction of secondary units. SPUR also recommends that the Code Advisory Committee of the Department of Building Inspection undertake a review of the code provisions governing the creation of new legal secondary units to determine whether any modifications to the provisions or their interpretation which would facilitate the creation of secondary units are warranted. In particular, the public health danger presented by low ceiling heights should be reassessed in light of the cost of lowering floors to comply with the 7'6" requirement, the pervasiveness of the problem (inspectors estimate that 40 percent of existing illegal units have ceiling heights lower than the requirement), and the recognition that there is no minimum ceiling height code requirement for any use other than residential. SPUR is not proposing an amnesty or any other action regarding existing illegal units. However, SPUR believes that the owner of an illegal unit should be allowed to apply for a permit to legalize the unit by meeting all applicable code requirements and paying applicable penalties for the illegal installation of the unit. Currently the maximum penalty is ten times the amount of the permit fees required to legalize the unit. If necessary, this penalty could be increased. It may be a good idea to dedicate revenues collected from in-law legalization fees to a neighborhood improvement fund, so that increased housing leads to tangible benefits for the neighborhood. The rent-control status of currently illegal units which could be made legal if SPUR's proposals are adopted will remain unchanged; if the unit is currently subject to rent control it would remain rent-controlled after it is brought into code compliance. If an illegal unit is legalized and the tenants of the unit are displaced by the work, the tenants would have the right to reoccupy the unit at the old rent after legalization. If needed, amendments to the rent ordinance should be adopted to guarantee this result. San Francisco's chronic housing shortage continues unabated. Production is hampered by lack of public funding for subsidized housing and neighborhood opposition to housing of all types. Secondary units, requiring no public funds or additional land and no change in the appearance of the neighborhood, provide an economical, quickly created and neighborhood-compatible solution. The SPUR Housing Committe orignally developed the ideas in this report under the leadership of S. Osborn Erickson, Tome Jones and George Williams. George Williams, committee chair, served as its principal author. The paper was first published April 2001. The paper was edited and updated in 2006 by Gabriel Metcalf and Sarah Karlinsky.